I would like to learn more about my beautiful clock (it is currently being repaired). 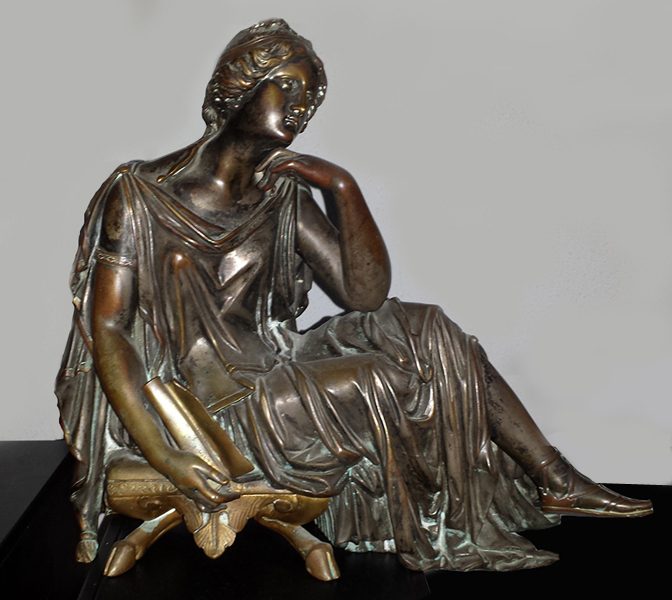 The repair shop owner suggested that I should look into trying to find out who the artist is of the bronze sculpture of a seated ancient Classical Greek Goddess reading Plato. The clock movement is dated circa 1855-1870 - Médaille d'Argent Vincenti et Cie. 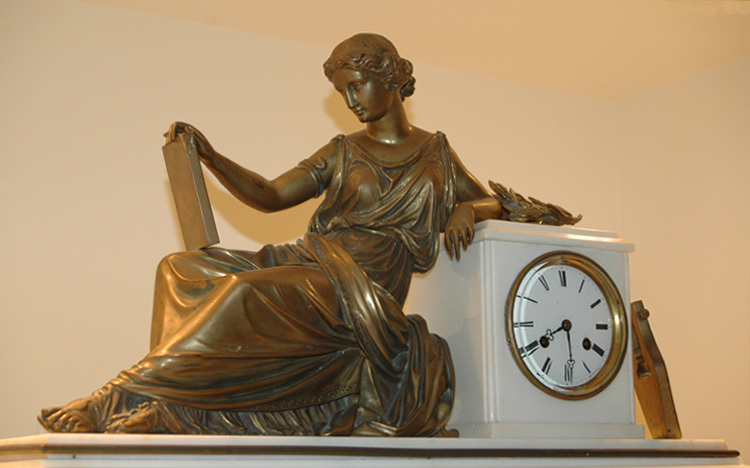 I did some research on the internet and I found another clock with the sculpture of a Greek Lyric poet  Sappho  by James Pradier. 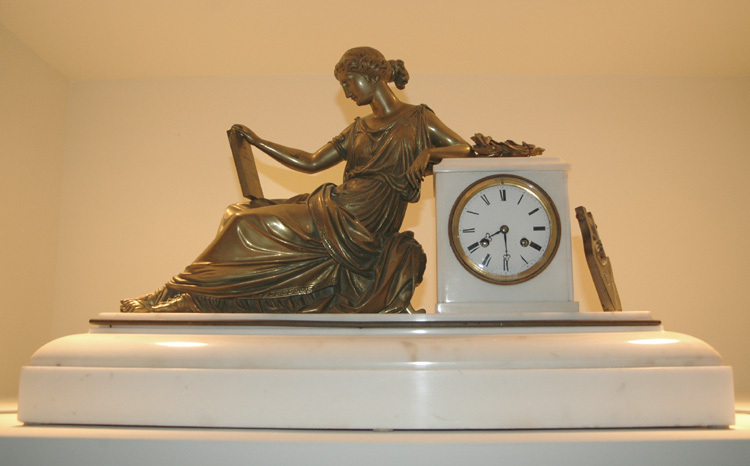 It resembles the statue on my white marble clock a lot. The statue is not signed and I wonder if another artist, perhaps his student might be responsible for the piece. I know it is hard to determine authenticity based on pictures alone but can you please give me your best opinion on it? 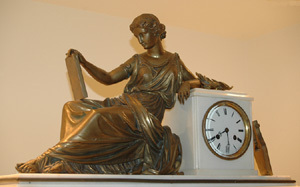 You will find ample information on both versions in Claude Lapaire's recent work, James Pradier et la sculpture française de la génération romantique. Catalogue raisonné (5 Continents Editions, Milano, and SIK ISEA, Lausanne, 2010). The first lady seems to be writing on a scroll, or maybe she is composing music since her title seems to be La Musicienne (The Musician). The second, like yours, is reading. Below are two other examples, both attributed to Pierre-Alexandre Schoenewerk (Paris 1820-1885). 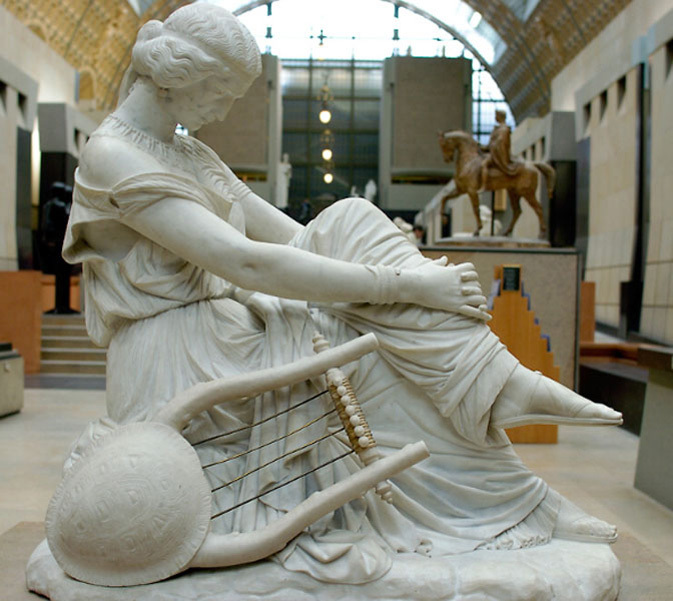 All four of these figures, like yours and like Pradier's Sapho, have a lyre at their side. But in fact, your clock has a completely different origin. If you do a combined search for the word « pendule » (or « clock ») and the name « Geoffrin » on the Internet, the results will immediately show you why! For not only will you find the story behind this piece but you will also see numerous examples of it with the same figure as yours. 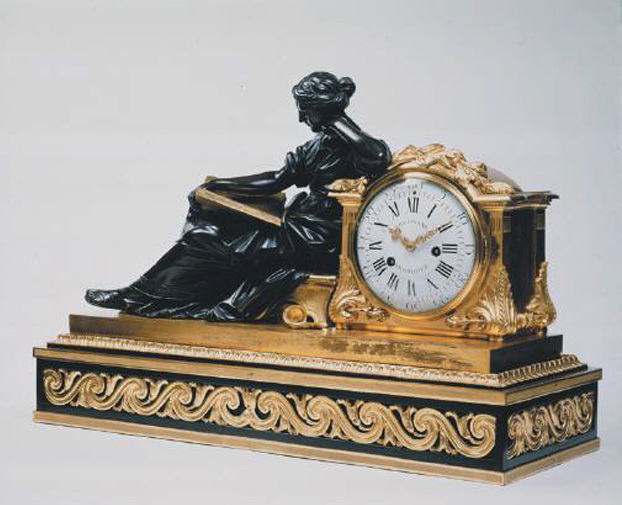 These are commonly known as « pendules à la Geoffrin » (« Geoffrin clocks ») and are all derived from the original one entitled Emploi du temps (literally, Use of Time) which belonged to Madame Geoffrin, née Marie Thérèse Rodet (Paris 1699-1777), whose famous salon in Paris was frequented by Diderot, Voltaire, D'Alembert, and Montesquieu, among many other leading personalities of the mid-18th century. If you can read French  or even if you can't!  you should take a look at the illustrated article about the clock on the site www.authenticité.fr. But there are many other sites with texts about it in English (cf. www.pelhamgalleries.com and www.richardreddingantiques.com). 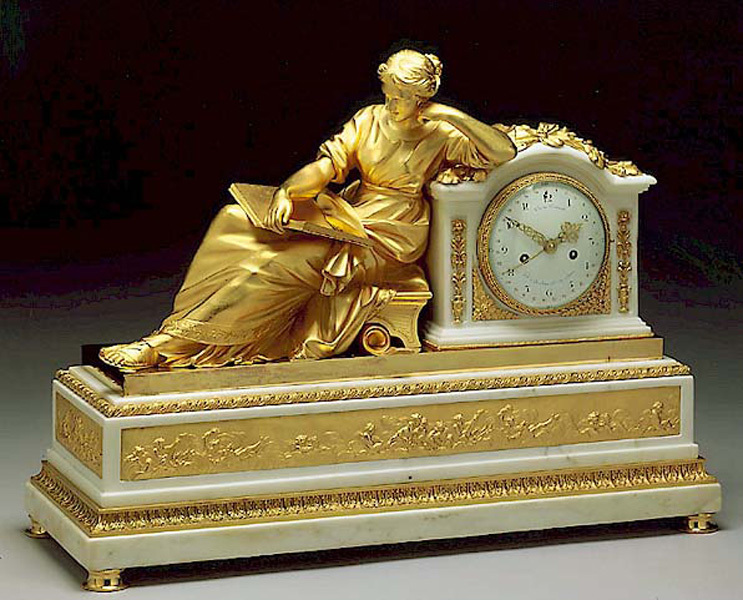 These explain that the orginal model was created for Madame Geoffrin by the sculptor Laurent Guiard, a student of Bouchardon, in 1754, and that she gave a replica of it to Denis Diderot in 1768 which is now in the Musée Du Breuil Saint-Germain in the town of Langres (Haute-Marne), Diderot's birthplace. 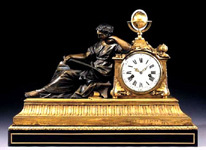 As for your clock's movement, there are many other examples on the Internet signed, like yours, Vincenti et Cie Médaille d'Argent, often followed by the date 1855. Vincenti, a Corsican, set up shop in Montbéliard in 1823 using machines of his own invention but went bankrupt within the year, at which point the business was taken over by his manager Roux to become Vincenti et Cie. 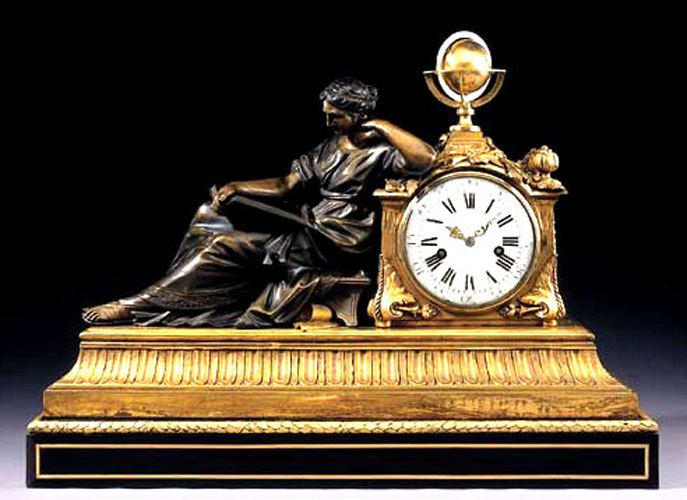 He died in 1834 but the company survived him and moved to Paris where it became one of the most productive clock mouvement makers in the world and obtained numerous distinctions, includuing silver medals at the Paris Expositions of 1834 and 1855. It's worth noting that on your piece the book is being held in an almost vertical position on the lady's right knee whereas in all the other examples shown above it is lying on her lap. By the way, can you tell me why you say she is reading Plato? Is the title of one of Plato's works, or an excerpt from one of them, inscribed on the back of the book or on its open pages? Perhaps this will give you more clues. Please let me know if you have any other questions or need more photos. Again, thank you very much for your research. It was good to hear back from you and I’m glad to know that after such a long delay my reply to your question may still be helpful. With regard to the writing on the book, the words « L’âme est immortelle » mean « The soul is immortal » and are from Plato’s Republic or one of his other works. 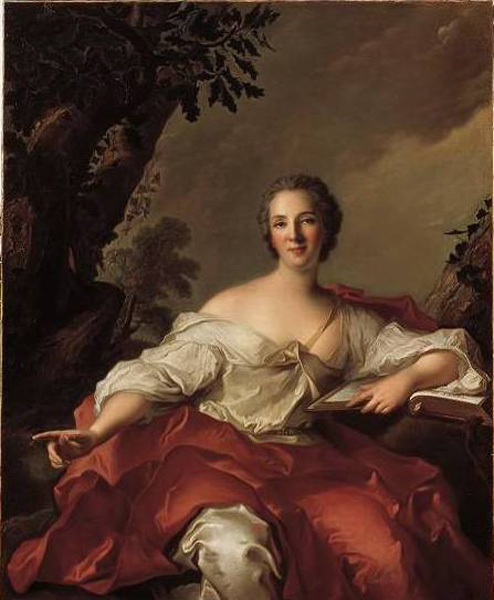 The immortality of the soul was one of Plato’s major themes and it was much debated by the philosophers who frequented Madame Geoffrin’s salon in the mid-18th century. It would be interesting to know if the the original Geoffrin clock and other copies of it have these same words on them. You might find the answer on the internet. 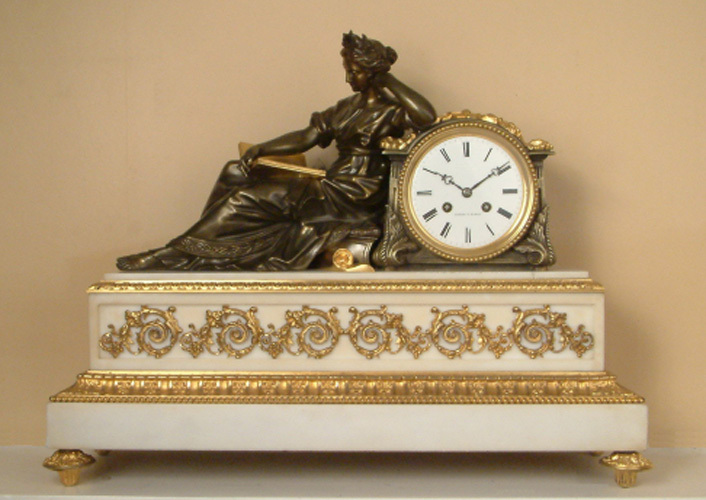 I just happened on a forum about clocks where someone asks a question about the foundry mark on a model similar to yours (click here to open the link). The mark on that model is a Croix de Malte (Maltese Cross). Does yours have any such marks or writing on it other than the words on the book? If so, they may help you to identify it further. In any case, I think that with what I sent you you have just about everything you need. Your bronze figure is not an original, unique piece, it’s one of many copies of the original Geoffrin figure (apparently a portrait of Madame Geoffrin herself) and probably dates from the 19th century, assuming that it was cast about the same time that your clock’s mouvement was made by the Vincenti company, which began in the 1820’s and thrived into the second half of the century. 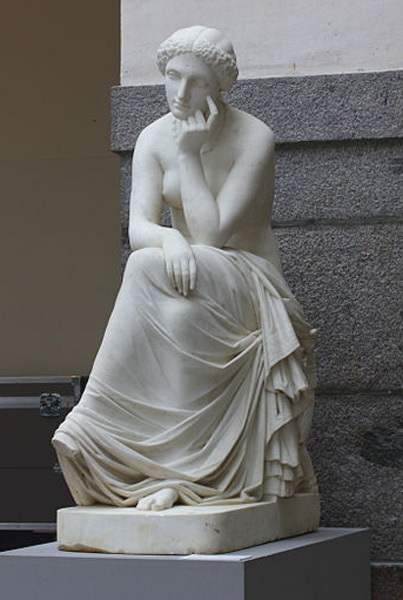 This lady (see picture) is vaguely related to Pradier's seated Sapho (Sapho assise). 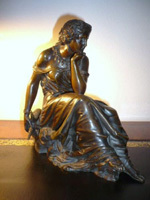 She is signed in the bronze V. Evrard for Victor Évrard (1807-1877). We forgot to mention that the lady is not only signed (V. Evrard), but also dated 1851. 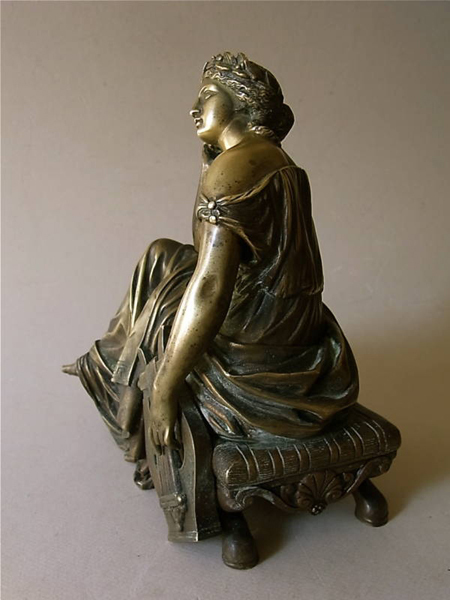 We believe that Pradier made his Sapho assise in the year 1852 (????). Please forgive this late response, due to technical problems with my new website. 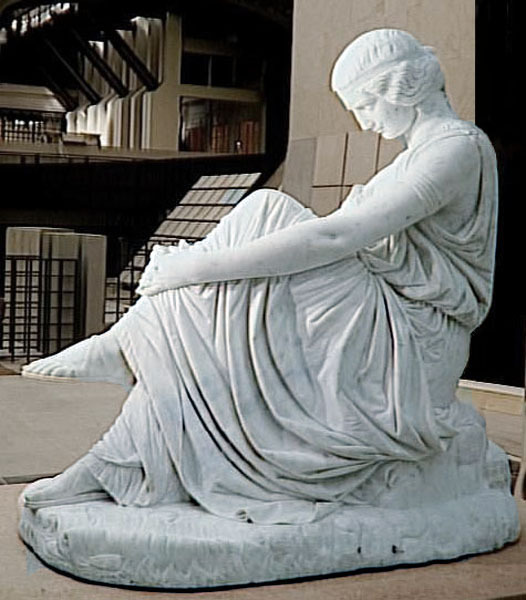 Your seated figure by Victor Évrard is certainly more closely related to Pradier's Sapho assise than the anonymous reclining figure you asked about in another posting on this Forum (Une Femme allongée polychrome  d'après Pradier?). 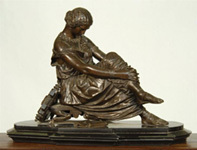 Like Pradier's figure, she has her legs crossed and is wearing classic Greek sandals. She is also sitting on the same type of stool with pied-de-biche feet and the sculptor's signature is inscribed in the same place on the stool. But I am referring to the bronze version of Pradier work, not to the marble figure which is seated on a rock and which was only completed and put on exhibit in 1852. 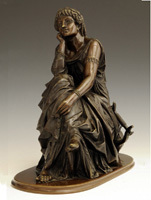 As Claude Lapaire points out in his recent catalog raisonné of Pradier's works, the bronze version was edited by Susse Frères at least a year earlier. 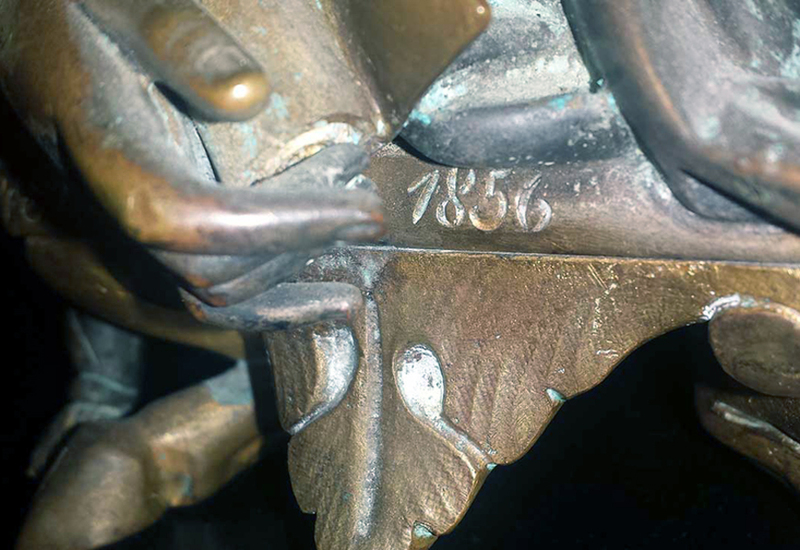 So if your bronze is dated 1851, it must have been inspired by that version. Actually yours looks quite new. 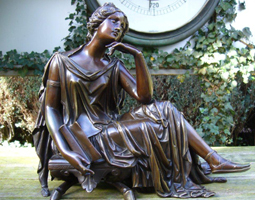 Is it a modern reproduction or has it recently been repatinated? 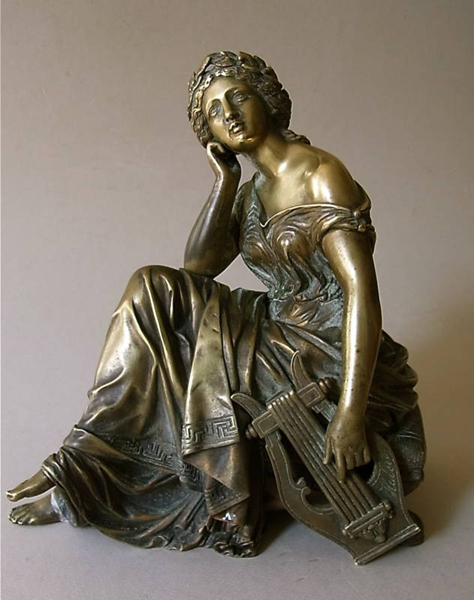 In the sales catalog this figure is intitled Allégorie de la musique. Total height, including the mantle clock, is 50 cm. 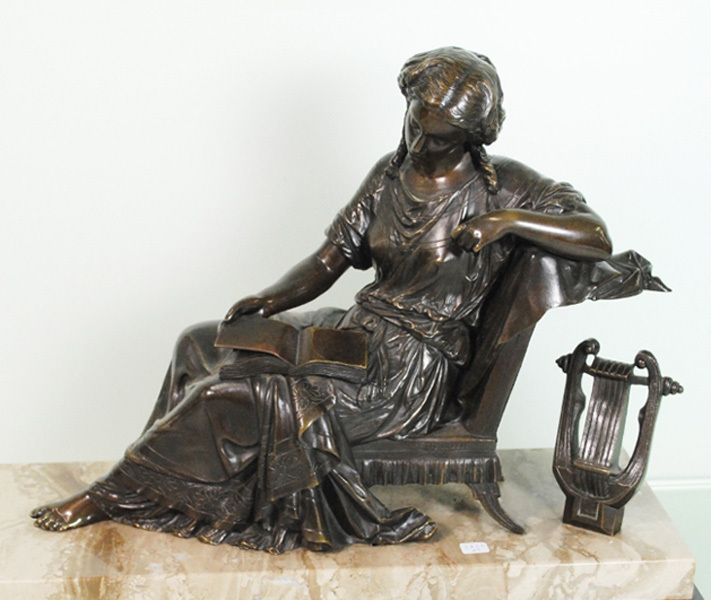 Unlike your figure and unlike Pradier's bronze Sapho, she is seated on a chair rather than on a stool. 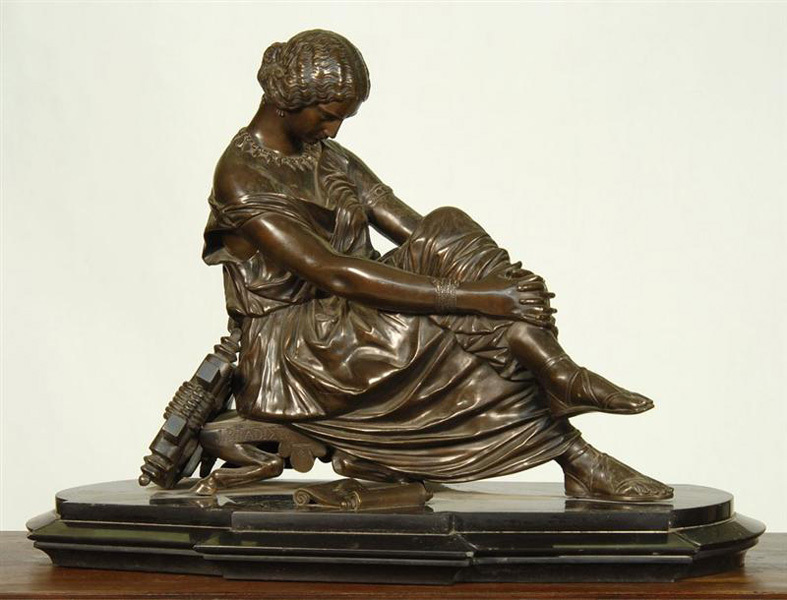 Otherwise Pradier's influence  assuming his bronze came first  is quite evident. This example was put up for sale on ebay in 2010. I have seen at least three others on sale since 2008. 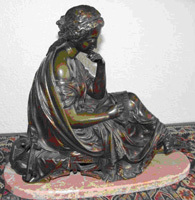 In her postings above on 16/8/2012 and 17/8/2012, Marion Feijen-Tullemans wondered if her figure by Victor Évrard dated 1851 had been designed earlier then Pradier’s seated Sapho. I own the same figure signed V. Evrard and numbered « 85 » under the base, but as can be seen in the third photo below it is dated 1856! I think there must be many copies and reproductions of this work. I understand of course that you can't give a good estimate of its worth on the basis of photos, but if you know anyone who would be interested in it, or if you know a forum or have contact information for some other place where I could put it on sale, I would be glad to hear from you. Further, would it be possible for you to put me in contact with Marion Feijen-Tullemans? I have some questions I would like to ask her as I assume her research for more information on this work and on Victor Évrard has gone further than mine. 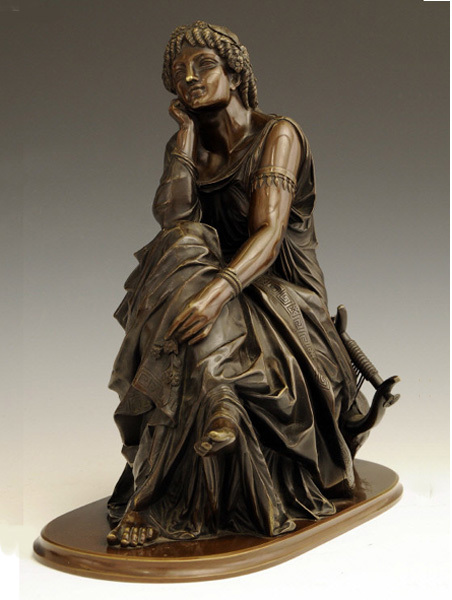 As I pointed out above in my reply to Marion Feijen-Tullemans, her bronze dated 1851 could have been inspired by the bronze version of Pradier's seated Sapho edited by Susse Frères at least a year before the marble version was exhibited at the 1852 Salon. But before responding to your querry I wanted to be sure that it was indeed dated 1851. So I took a closer look at the photo she sent me and see now, after enlarging it, that the date seems to be 1856, the same as on yours and engraved at exactly the same spot. She didn't say whether the figure is numbered like yours on the underside of the base. I'll forward your querry to her so that she can contact you. I am not a merchant myself and am not familiar with the current market value of Évrard's works. You can easily search the internet to see what simiar works by him have been sold for. The site Artprice would be a good place to start but you have to pay for a subscription to see the sales results (it presently lists 16). Other results are available for free on the Blouin Art Sales Index. You can also try invaluable and liveuctioneers. 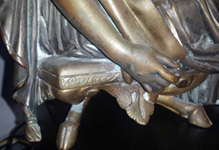 As concerns where you could try to sell your bronze, you might consider posting an ad on ebay. 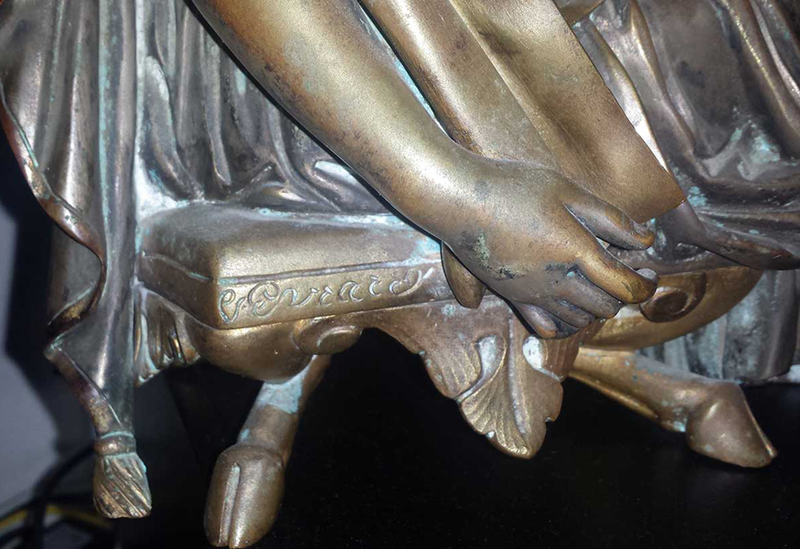 I see that two of Évrard's bronzes are presently on sale on the Dutch site at www.ebay.nl. 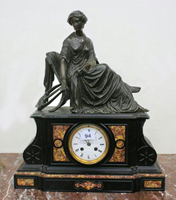 There are of course any number of auction houses and antique shops you could try. 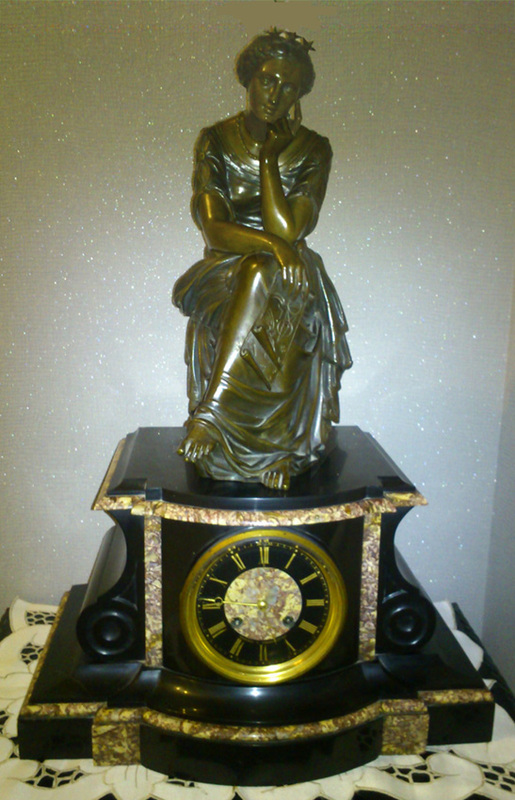 Je possède une pendule de cheminée marbre et bronze ressemblant fortement à celles de Pradier. Pouvez vous m'indiquer si elle a de la valeur? 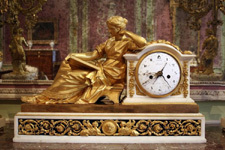 Vous trouverez de nombreuses pendules dans la rubrique « Ventes » de ce site. 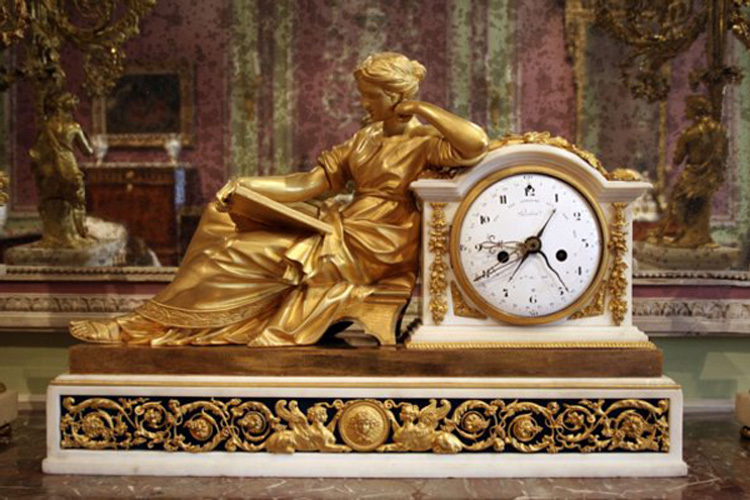 Les plus courantes sont surmontées de la Sapho assise de Pradier et leur valeur peut osciller entre 1.000 et 5.000 euros ou plus, cela dépend de beaucoup de choses. Si vous m'envoyiez des photos de la vôtre je pourrais éventuellement la comparer à d'autres du même type. J'ai oublié de préciser: il y a une signature sur la statue: « travaux ». 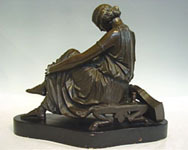 Dans son catalogue raisonné de Pradier, Claude Lapaire mentionne, p. 418, à propos d'une œuvre de Pradier éditée sous le même titre par Susse Frères, qu'un bronze, hauteur 37 cm, signé « Travaux », conservé au Musée des beaux-arts de Besançon (sans n° d’inventaire, ancien fonds), a fait l’objet d’une édition par les ateliers du musée (Catalogue des moulages des musées de Besançon, Besançon, 2000, n° 74). 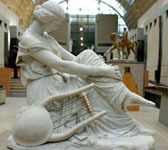 Ce musée pourrait éventuellement vous dire si cette édition correpond à la vôtre, qui est plus habillée que la statue en marbre conservée à Rennes et en diffère aussi par sa couronne d’étoiles et par le parchemin qu’elle tient à la main droite. Vous trouverez un bref aperçu de la carrière de Pierre Travaux sur le site www.wikiphidias.fr ainsi que sur le site wikipedia.org. Voir également la notice sur La Rêverie dans la base Joconde. Mille mercis pour vos recherches, je vais voir tout cela tranquillement.